Sand bar in Armada Resort. Zambales is known for its surf spots (Pundaquit, Crystal and Liwa) and secluded coves (Anawangin, Nagsasa, Talisayin and Silanguin) down south. From these towns, three more hours going north by bus, past Iba, will bring you to several islands with unspoiled beaches and less people. One of the less popular spots is Magalawa Island in Palauig. Take the Sta. Cruz route of Victory Liner from Pasay, Cubao or Caloocan Terminal. Call their respective branches first to know the schedule. Travel time is around 6-7 hours. Go down in Brgy. Pangolingan, Palauig, where you’ll see a few tricycles on your left and a lane of vegetable stalls on your right. Not all bus drivers are familiar with this drop-off point but these words may ring a bell to them: Luan Port, Masinloc Town or Radio Veritas Road. Take a tricycle to Armada Compound to buy supplies. Travel time is around 20 – 30 minutes. Ride a boat to Magalawa Island. Travel time is less than 10 minutes. There are two resorts in the island – Armada and Ruiz. Both have adequate space for tents, spacious cottages for big groups and a dozen of shower rooms with toilet around the resort. Just take note that there’s bad blood between both resorts – so don’t try sneaking or trespassing without asking permission. We stayed in Ruiz Resort because Armada doesn’t allow bringing of your own tent; however, once we got on the island, we learned that Armada had the better beach front – cleaner and clearer water (thanks to the riptide/current on their side), longer shoreline and bigger campsites. Our reco: Armada Resort because the famous Magalawa Island sandbar is here. 1100 Arrival at Armada Compound. Buy groceries and supplies. Ride the tricycle to the port. 1200 Arrival at jump-off. Take boat Magalawa Island. 1210 Arrival at Ruiz Resort in Magalawa Island. Set-up camp, roam the island. Depending on which bus schedule you’ll take, the bus ride from Manila to Palauig takes around 6-7 hours. Our bus bound for Sta. Cruz left exactly at 4 am. Same to all bus rides that take six hours or more, we suggest to book night trips so you can sleep for most of the journey. There will be at least three stops – Tarlac, Olongapo and Iba. From Iba, it will only take about an hour to Palauig. Go down at Brgy. Pangolingan, a few minutes north from Palauig town proper. A queue of tricycles is on the other side of the road. Take one to Armada Compound. Just a word of caution: the 30 minute ride is rough and dusty. We arrived in Armada Compound at around 11 am. From here, you can call out boatman Mang Mulo from Ruiz Resort at 0929 467 0505. Once you’re done stocking up, you need to ride the tricycle one last time to the port. 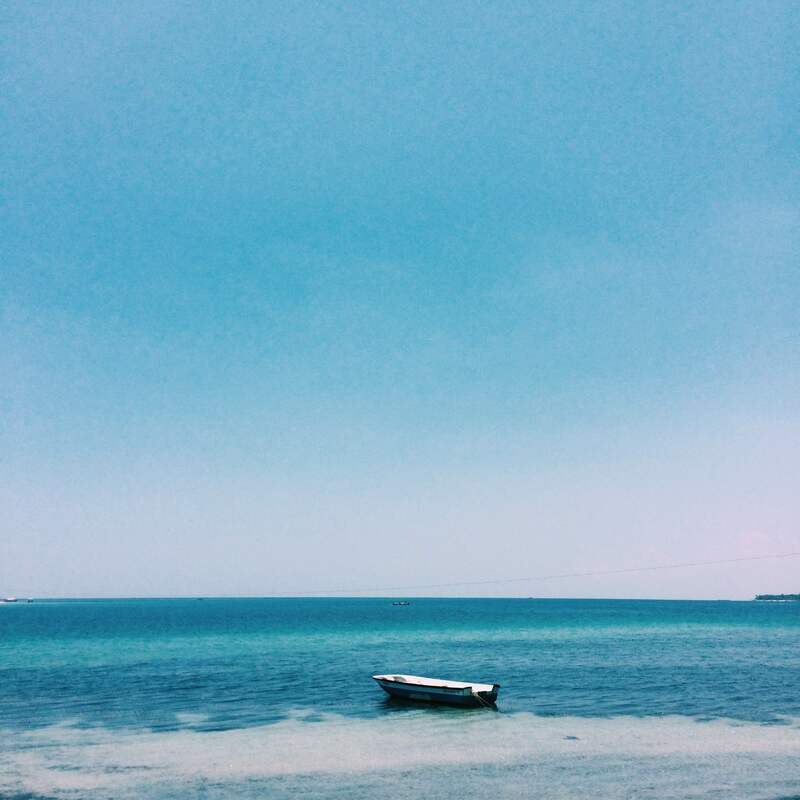 The tricycle ride ends as glistening waters and a glimpse of Magalawa Island greets you from afar. Sparkling blue waters of Palauig. The boat ride from the port to Ruiz Resort takes around 5-10 minutes, passing Armada Resort’s sandbar. Once you get there, you can either rent the cottage or find a camping spot. Be aware of the water pump when looking for a spot to pitch your tents because this goes on every 30 minutes or so. It can get really noisy. As soon as you’re settled, you can roam around the little resort. There are overnight and day-trip cottages, shower rooms with toilet, a sari-sari store, a beach volleyball court and a coast line of light colored (note: not white) sand that spans for not more than 100 meters. When facing the beach, to your right is Armada Resort. Since there wasn’t much to do in Ruiz, or in Magalawa in general, cross to Armada through the beaten trail behind Ruiz Resort. Look for the coast guard and pay P50. Enjoy the cleaner waters and take photos on the famous sandbar. 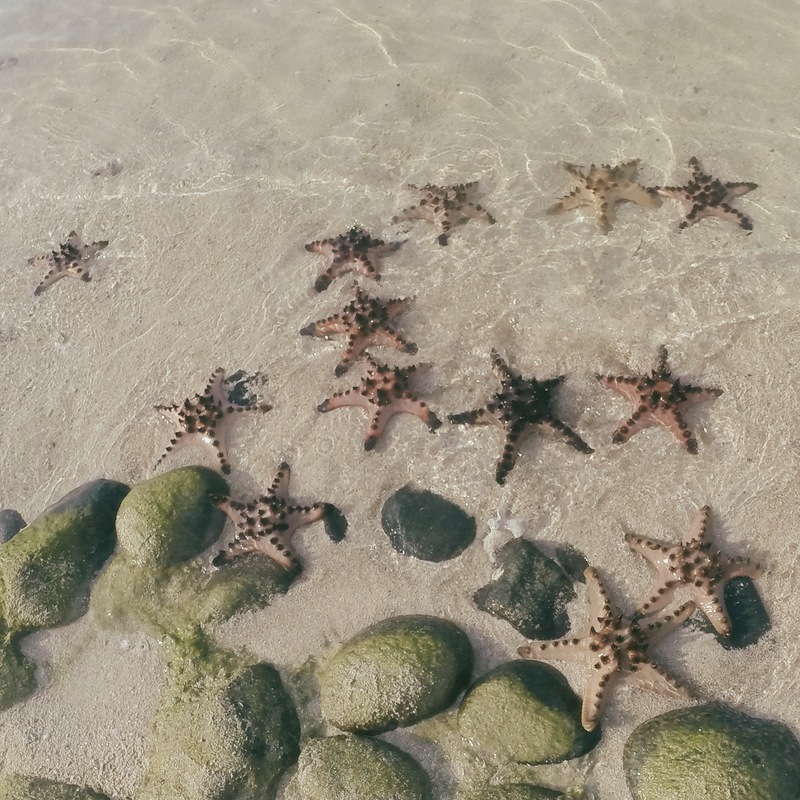 There are plenty of starfish around the island. Do last minute swimming in the morning when the tide’s high and most people are still asleep. You can cook your own breakfast or buy from Leny’s carinderia, a stone’s throw away from the back of the sari-sari store in Ruiz. Wash-up, pack-up, clean-up and you’re good to go! Ride the same boat and tricycle back to the bus stop along the main road of Palauig, Zambales. You can either try your luck and wait for an Olongapo/Manila-bound bus from Sta. Cruz or ride the more frequent jeeps to Iba Victory Liner Terminal. We recommend the latter. Once in Iba terminal, bus schedules to Pasay, Cubao and Caloocan are already frequent. You may also have late lunch in Iba while waiting for the next bus. Transportation: P401 Pasay to Palauig. P350 Iba to Pasay. P100 Tricycle from bus drop-off to Armada compound and port. P100 tricycle from port to Palauig main road. P23 jeep to Iba. Accommodation: P200/tent. Cottage and Tent rentals available. Food: Free. There’s a floating restaurant in Armada and a couple of carinderias around the island but we suggest to pack your meals instead. Grilling stations are also available for free. Entrance Fees: P100 per head entrance in Ruiz Resort. Stay in Armada Resort. If you’re not into sleeping in tents, both resorts offer cottages for only P500, good for 4-5 people. To be frank, the sand bar is the only thing worth of your 7-8 hour travel time. We can name several beaches or islands also in Zambales at par, or more beautiful than Magalawa Island. The current between the port and Magalawa Island, specifically near the sand bar, is really strong. We’ve learned from the locals that a couple of people died from drowning here. Buy supplies from Manila or outside from the stores outside Armada Compound. As expected, food and drinks in the island are more expensive. If you’re on a budget, stay at Ruiz Resort then just pay the P50 entrance at Armada to enjoy the sandbar. Accommodation in Armada Resort is more expensive. Even though the island is big, choices for camping spots is limited. 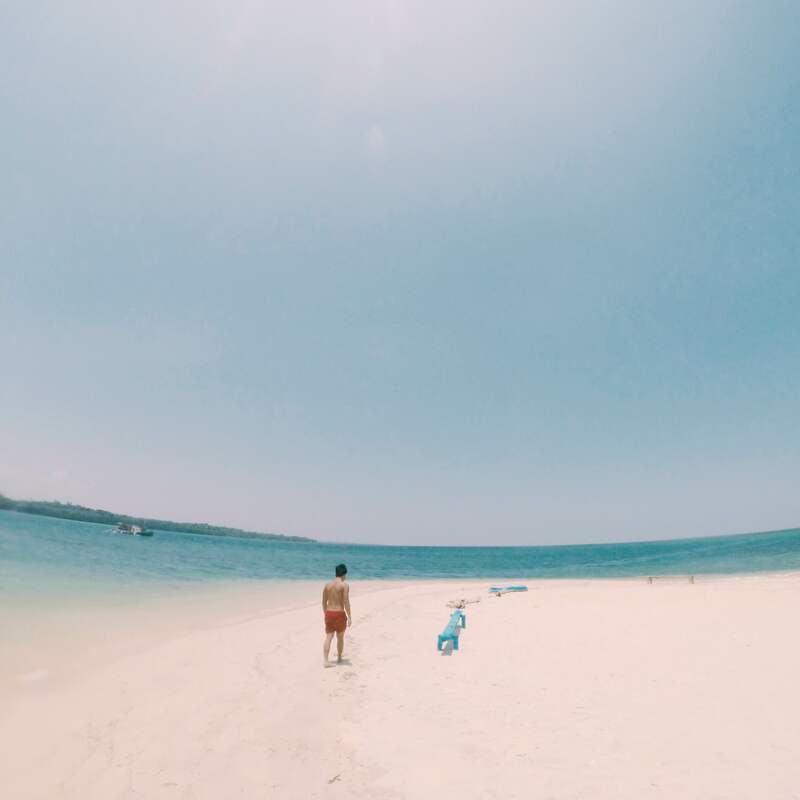 If you want a beach all to yourself, Potipot Island can be an alternative. We can bring alcohol (liqour) in resort ?